Reserved Shared Table Seating on the Balcony Deck (Deck 2), you will be Seated with Other Guests. Reserved Shared Table Seating on the Admirals Deck (Deck 3), you will be Seated with Other Guests. Fill up your stomach and fill up your cup with the four-hour open bar available for all guests! No matter what drink you’re craving, the bartenders on board will keep them coming! Sail and celebrate on this NYC July 4th cruise and get ready to watch the July 4th fireworks like you never have. This NYC July 4th cruise is going to treat you to one of the best views of the fireworks that you will experience this year! When the fireworks launch into the night sky, the Cornucopia Majesty will stop sailing and give you a front row seat to the show. There’s no better way to celebrate July 4th than on board this NYC July 4th cruise! 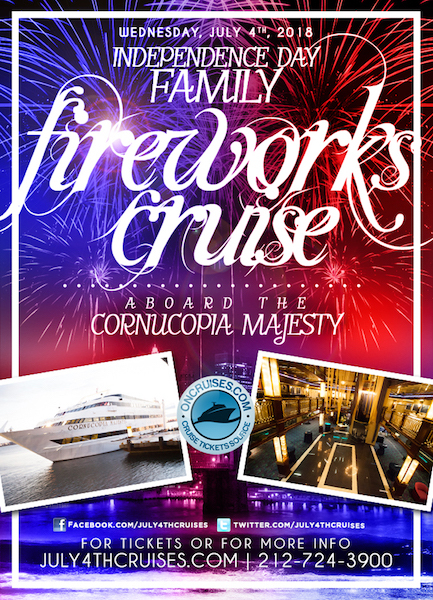 Grab the family and book your tickets on board the Cornucopia Majesty today.